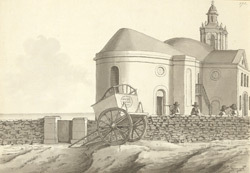 The Church of St George, Reforne, was built in 1754-1766 by Thomas Gilbert, a Portland mason, who was strongly influenced by Sir Christopher Wren's design of St Paul's Cathedral. Both buildings were constructed using the renowned Portland stone. In the foreground of the drawing is a cart belonging to John Gibb, proprietor of the Portland Arms.